card text: Other red creatures you control get +1/+1. Other white creatures you control get +1/+1. 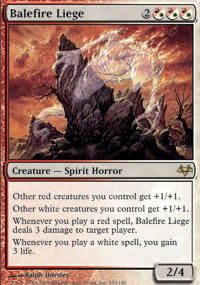 Whenever you play a red spell, Balefire Liege deals 3 damage to target player. Whenever you play a white spell, you gain 3 life.